Talk about leaving the best till last as Orange Culture wraps up this year's edition of LFW in spectacular style. It was the last day of Lagos Fashion Week 2018 and quite possibly the most highly-anticipated show of the week. Orange Culture closes Lagos Fashion Week 2018 with &apos;Orange Moon&apos;. The atmosphere in the main tent buzzed as fans were visibly excited and expectant for the final show. It was definitely the most attending show of the whole event, testament to the pulling power of Orange Culture and the label&apos;s influence within the industry. We use our Spring/ Summer 2019 to explore the fight for identity in a world where ideologies and stereotypes are constantly pushing against one&apos;s ability to fully bloom. Most societies have coerced people into managing two personalities, one in the daytime, one at nighttime. The theme of the evening was &apos;Orange Moon&apos; which was pictured on the screens and looked somewhat like a blood moon. A &apos;blood moon&apos; is a name given to the moon during a lunar eclipse. A lunar eclipse occurs when the Earth passes between the sun and the moon, casting the moon into shadow. Unlike with a solar eclipse, when the moon passes between the Earth and sun, blocking the sun’s light, the moon does not go dark during an eclipse, but instead appears to turn red or a rusty orange. Orange Culture has always prided themselves on being a label that is so much more than the clothes. 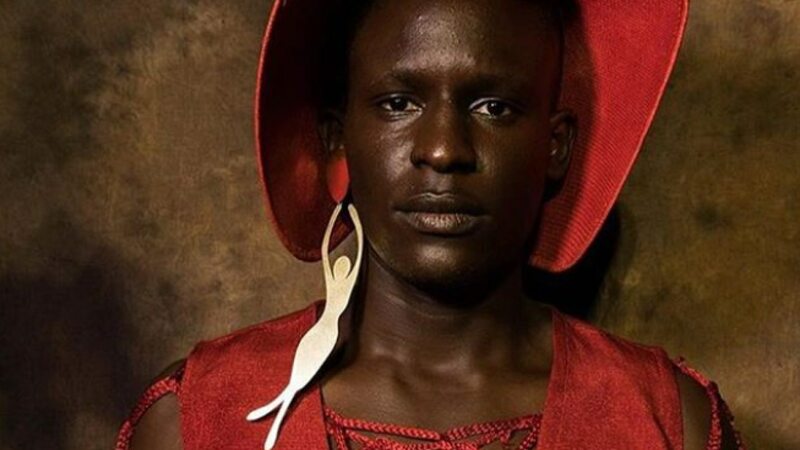 This does not however, mean that Orange Culture forgets women who have taken over the brand, giving an androgynous twist on Adebayo’s designs. The garments answer to just about anyone who&apos;s interested in telling a story with the way they present themselves. All pieces are manufactured in Lagos, from ethically-sourced fabrics from local Nigerian fabric makers. Orange Culture takes our staff through rigorous training processes and offer them the opportunity to attend skill acquisition initiatives. For the first time throughout Lagos Fashion Week, Orange Culture had all thee models come onto the runway at once. The models congregated in the middle giving the audience a chance to get a good look at what he had in store. Immediately, we noticed a riot of colour. It was a sign that OC had returned to his niche, colourful, fun, playful clothing. The show ended with a chilling performance by singer and friend of the label, Falana. Falana strutted down the runway wearing a black silk tunic, white knee high boots and silver leggings as she gave the acapella performance to end all performances. As she sang, models filed to the top of the runway and as the performance reached its peak, Bayo Oke-Lawal, the creative genius took his final bow. The crowd stood to their feet and erupted in applause as they congratulated him for a job that was very well done. Orange Culture has become one of the most solid brands in the Nigerian fashion industry. Consistently creating great-quality, well thought- out collections that constantly challenge our ideas of menswear and how we use clothes to express ourselves. As he continues to grow from collection to collection, it&apos;s exciting to see where he will end up and how long it will take the international fashion community to pay proper attention to what is quite clearly, a star on the rise.